A friend recently asked how to get Omnifocus setup to sync with multiple devices. I had some trouble remembering myself so I thought I’d put the instructions in a more permanent form here. If you haven’t heard of Omnifocus it’s a great personal task management system. It follows the “Getting Things Done” philosophy of breaking your todo list up into multiple groupings based on the “context” in which you are able to accomplish the task. So instead of working on a project, you work on “anything I can do while I’m in my email client”. If you want to learn more about getting things done you can check out the book. I use the WebDav settings in OmniFocus in order to let all of my devices sync even if they aren’t connected to the same network. Omnifocus has the ability to sync over the local wireless network, but since I do a lot of syncing from the iPhone, which is not always connected to the wireless network (there are some dead zones at the office so I usually leave it connected to 3G) so I prefer the webdav option since the devices don’t need to be on the same network. There are multiple different paths you can follow to configured your devices, this is the one that I found works for me. Omnifocus has some tools that will help you configure multiple devices but I found that they don’t always work reliably and I had to learn how to configure everything manually. Omnifocus is also building out their own sync network, but since it’s currently in beta, I’m not inclined to recommend it yet. When they do get it setup it will simplify these instructions. Step 1: Setup a webdav system. In Omnifocus, open preferences (Command + ‘,’ ) click not the sync tab, and then the advanced sub option. It should look like this. Notice the location field, that url will be the same for you, except where it says ‘username’ you will need to use your username. Once you have entered the location click the sync now button and Omnifocus should ask you for your password. 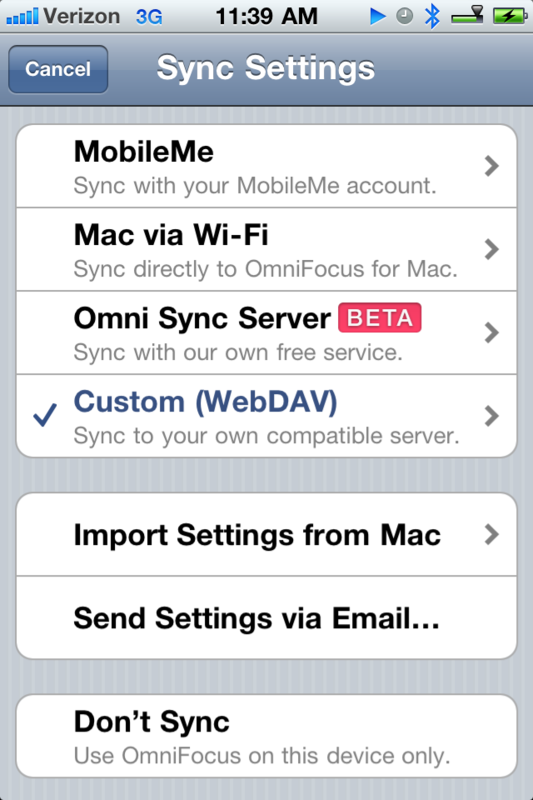 Let the process run and you will now have a copy of your omnifocus tasks on the swissdisk webdav server. Open Omnifocus on the iPhone and open the preferences dialog. (the gear looking icon the lower right hand corner). 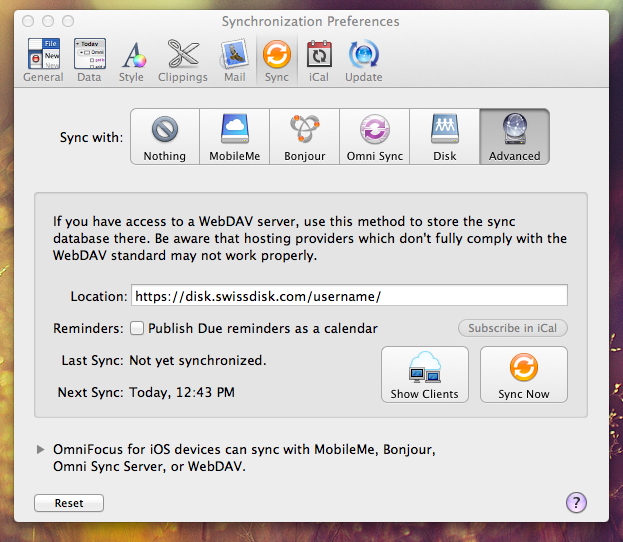 Select the Sync Method option, and on the following page select WebDav. On the next page enter the same swissdisk url as you used in Omnifocus for the Mac. Click the sync button in the upper right hand corner, and your iPhone should prompt you for your password. At this point you should be looking at your Omnifocus tasks from the mac on your iPhone.